Muskegon events honor Martin Luther King Jr.
MUSKEGON, Mich. (WZZM) -- "Stand up for right" was the central theme for Muskegon's largest MLK Day events. The community remembered King's dream with the distribution of a food truck to needy families. Then, everyone gathered inside First Congregational Church for a community luncheon. Participants remembered Dr. King with music and essays from students in the Muskegon Public Schools. The students wrote about ending violence and bullying. One first-grader shared his dream to one day become President of the United States. MUSKEGON, Mich. (WZZM) -- Charmaine Handy has searched for her lost family for decades and on Saturday, after 47 years apart, she was reunited with her mother Jessie Thurmond. Handy was then removed from her grandmother’s care at the age of three and put in the foster system. Handy said she’s searched for her family for years, but never could find them because of name changes. MUSKEGON, Mich. (WZZM)-- With the snow finally on the ground in West Michigan, winter sports are in fulls swing. A unique experience can be found at the Muskegon Winter Sports Complex. 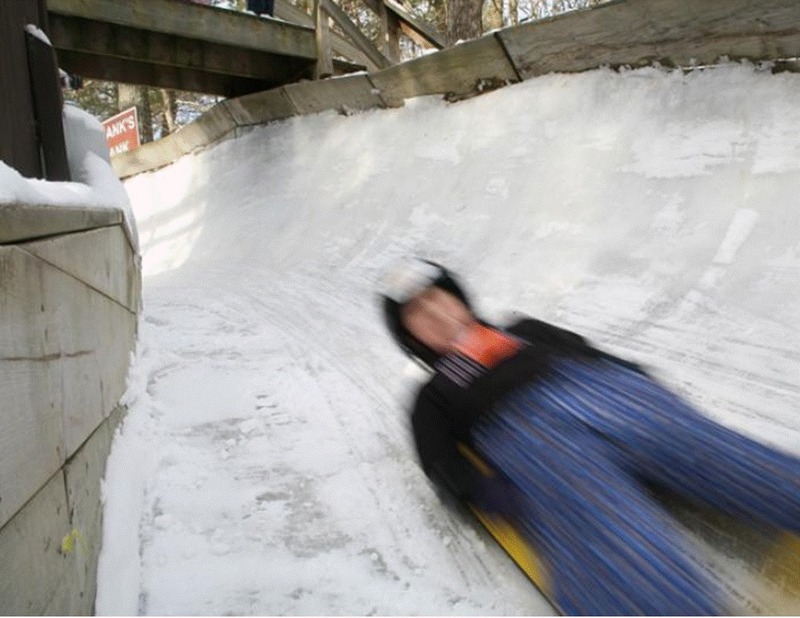 Meteorologist Alana Nehring, and Meteorologist Laura Hartman take their chances at luging. MUSKEGON, Mich. (WZZM) -- The effort to provide college scholarship money to students in Muskegon County has reached a significant milestone. Since its launch in October, the Muskegon Area Promise fundraising effort has received support from several donors. At the Lakeshore Chamber of Commerce Friday afternoon, organizers announced those donations have passed the $1 million mark. A recent $100,000 donation from the Community Foundation for Muskegon County pushed the fund past that point. The Muskegon Area Promise is a scholarship program modeled after the Kalamazoo Promise. It provides money for tuition, book costs, and fees, up to $4,000. For now, it's for graduates of Muskegon, Muskegon Heights, and Holton high schools. It will be expanded countywide in 2017. MUSKEGON HEIGHTS, Mich. (WZZM) -- "We will make them very uncomfortable, and we will either get them to change their behavior or get them to go some place else." That's the message to criminals, from the man hired to lead the Muskegon Heights Police Department for now and help find a permanent chief. Dr. Joseph Thomas Jr. is a Muskegon Heights outsider, called on to bring change to the city's police department and community. Thursday, Thomas outlined his vision for the community, as the city is filling so many vacant leadership positions. MUSKEGON, Mich. (WZZM) -- The City of Muskegon is taking over an apartment project from a private developer after the work stalled for several years. If successful, the development would create more housing options in the heart of downtown. The City is already in a development agreement with Allen Edwin Homes to build Midtown Square. The nine single family homes are four blocks from downtown. On Wednesday, city leaders were showing off their new housing project that will tower over Western Avenue. "You have never seen anything like this," said Mohammed Al-Shatel, City of Muskegon Director of Public Works. MUSKEGON, Mich. (WZZM) -- Police in Muskegon responded to a rollover accident, involving a pick up truck Wednesday morning. Police say ice on the bridge caused the truck to lose control near Laketon Avenue. The driver was transported to the hospital but we are not sure of their condition. Police tell us there were reports of other slide offs near the River Flats area, between Apple and M-120. That area is known to be slick because it's where the highway crosses the Muskegon River.